lizards to even other scorpions. This makes it easy for them to sustain life and mate, especially in homes that provide them with a balanced environment. pincers on the front and a rounded tail. When it comes to their legs, they have the typical eight legs associated with scorpions. Bark scorpions also have a stripe which goes down the center of their back. And their tail ends with a stinger which has the most poisonous venom of the species. Although these pests are found mostly in Southern Arizona, they are still a problem in Nevada, the Grand Canyon, and southern California. Although scorpions can bite humans and pets, their “bite” comes from their venomous sting. Such a sting can cause extreme swelling, numbness, and conclusions. Some victims of a bark scorpion sting may also have a hard time breathing, and those that are allergic may be seriously affected by such a bite. Those victims that are allergic are more likely to survive if they have antivenom administered timely enough. Bark scorpions are found in dry climates, specifically the desert. To preserve the water within their bodies they are dormant during the day and lay in shadows. Living between walls and under rocks for example is a perfect environment for these scorpions. They get more water through the other small bugs, lizards, and scorpions which they eat. Since these pests spend their time resting during the day, they are nocturnal and most active during the night. This is when they come out and hunt small bugs and animals, including but not limited to mice, rats, birds, and even centipedes. Preying is accomplished by using their pincers to crush small bugs and then ingest them, or using their poison to paralyze and kill prey. Scorpions don’t live obvious signs that they have infested a home, other than when they are visibly spotted while hunting. By the time one scorpion is seen it is highly likely that others might be present due to a rapid mating cycle. When it comes to bark scorpion reproduction, the females carry eggs inside their bodies. When these young scorpions hatch they then go onto the mother’s back until their first molt arrives. After they have molted, they are then ready to live on their own. Bark scorpions live between three to five years, but some have been known to live for longer than this. How Do Bark Scorpions Enter Homes? A home with small cracks in the walls or foundation, large spaces underneath doors, and other access points makes it easy for a scorpion to get inside and make use of a good place to live and mate. After entering a home, scorpions will mostly nest in basements, underneath kitchen cabinets, crawl spaces, and between walls if they have a way to get in. If you have a scorpion problem on your hands or want your home inspected for these pests to insure you and your families safety, then give us a call at (702) 871-1211. We have over a decade of experience eradicating bark scorpions, among many other types, as well as employing various human and pet-safe treatments to keep them out. 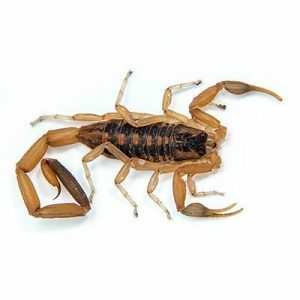 Although bark scorpions may have an abundant food source in Las Vegas, Henderson NV and appear extremely resilient, they are no match for our pest control techniques and treatments which keep them out season after season.